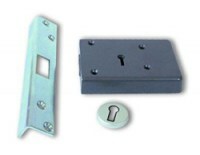 Here at locktrader we have an extensive range of Rim Locks and Night Latches, suitable for internal and external doors. We have the latest British Standard Nightlatches from ERA, Ingersoll and Yale. A rim lock is one that is fitted to the inside surface of a door. Rim locks fitted to external doors are normally night latches and often referred to as Yale Locks. Rim Locks are available from Asec, Basta, ERA, Ingersoll, Legge, Yale and Union in various shapes and sizes. Don't miss out, great deals on Rim Locks and Nightlatches.